I was doing a Nutrition Response Testing session with a client yesterday. Being creative, I came up with a way to test myself. But I really cannot do the test on myself and have to go another practitioner (which I do have). I can only test a supplement or food item! The video below shows how I am using NRT to show sugar weakens the body. The body is basically a bundle of energy. In Chinese Medicine, they talk about chakras and meridian energy points. When these energy points are stuck or blocked, the body starts to either degrade or start showing symptoms of ill-health. The same thing happens with eating the wrong foods or supplements for our body. If we eat one that is the wrong energy, or low energy, our bodies develop a block in energy flow, and it can develop weakness – sometimes in the immune system, pain in various parts of the body or other dysfunction. Nutrition Response Testing is one of the tools I use to help identify some of these blocks. It can identify where the block is, what the cause of the block is and then I can determine whether we just need to eliminate that food, additive, etc or use a supplement like a digestive enzyme to help correct the imbalance. In the video, you will see how I test sugar. I hold a 2.5 pound weight and lift it. I know how it feels when I lift it – either easy or hard. With the sugar packet on me, it was hard and I could hardly lift the weight. Sugar is obviously a low energy ‘food’ and so I can either add a digestive enzyme (which I tested several – some were no change, others were ok and one was really good!). Then to have some fun, I tested a leaf of kale, fresh from the garden. It has a ton of energy and made lifting the weight easier! Honest! Then I tested my favorite chocolate, Dove. First in the wrapper – as often foil wrapping is a negative influence on energy flow….then without. 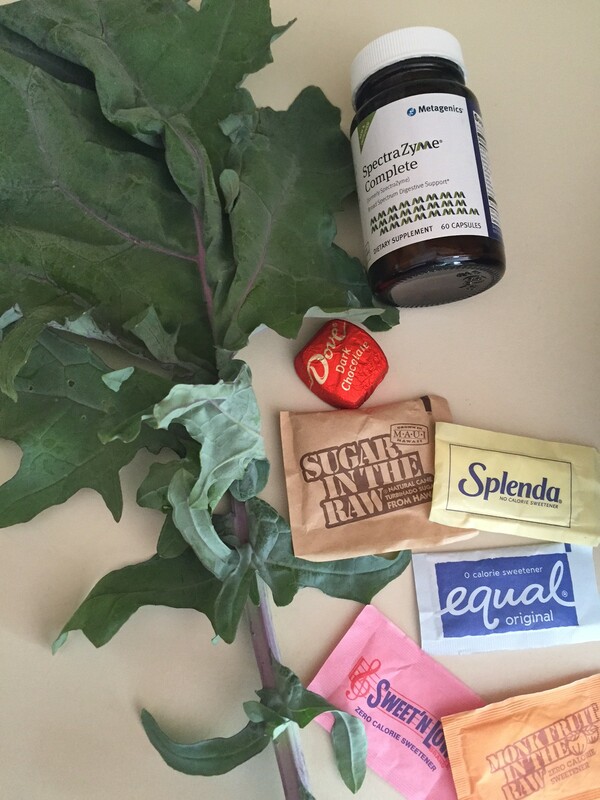 I also tested Equal, an artificial sweetener – here I would hardly lift the weight at all! No kidding! Won’t be eating that any time soon. Unless I want to weaken my body’s natural energy. I did test the chocolate and sugar with various digestive enzymes. But I wonder, should I eat kale with my chocolate?? As you can see from the video, sugar weakens me. With a digestive enzyme, I regain my strength. With kale, a high vibration food, I regain my strength. With Equal, I have no strength. Nutrition Response Testing is a great tool to use to determine where are the energy blocks, but more importantly, what is causing the block! And how do we correct this block? Sometimes it is the combination of high energy foods like kale, with lower energy foods containing sugar. But ideally, we shouldn’t be consuming sugar as it weakens our energy flow. NRT can show how sugar and other foods can weaken the body. I want to know in the comments below – have you tried this at home? What were your results?? Or schedule your NRT session so we can help the energy flow once again at a higher level so you can live life better, not just longer. We will find alternatives so you can still enjoy your treats…with the right anecdote 🙂 Kale and chocolate anyone?? Note: This can also apply to athletes sports drinks – too much sugar can weaken your race efforts! Sugar can cause GI distress in longer events.